At Impex, our service is rooted in a firm commitment to quality and reliability. This commitment extends beyond the excellence of our fine products to include value-added features such as supplier development, quality assurance, purchasing, materials planning, export documentation, ocean and inland transportation, customs clearance, and warehousing to name a few. The Impex distribution process relies on rigorous preparation, allowing us to fulfill orders precisely on time. It also allows us to make adjustments for unforeseen orders without imposing excessive demands on our normal business practices. Impex facilities feature abundant capacity in a clean, climate controlled warehouse for product storage with loading docks and available third party logistics services. Each product receipt is scrutinized, verified, and properly identified before being incorporated into Impex Certified Inventory. Impex offers same-day shipping on all products in stock. 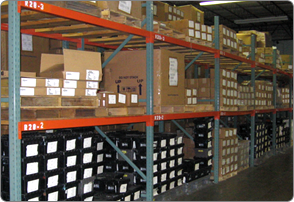 Our goal is to meet your need, so prompt delivery is an essential element of order fulfillment. We offer inventory control and management solutions to fit more specific requirements, and we comply with AIAG, Mil specifications, and customer bar coding. We also provide EDI and e-commerce order processing to accommodate paperless systems. Impex provides many special services such as wire shaving, precision drilling, locking patch elements, sorting, kitting, bagging, and assembly. We also offer common secondary operations such as heat treating, passivation, organic plating, and several other readily available plating finishes to serve your specific requirements.